April 25 - Thursday - Local time: 22:46 (CDT) Working too late! Stereo Microscope with still or video capture. Climate controlled, well lit and with plenty of room (550 square feet). If needed, there is a 700 square foot shop behind the laboratory. Two large exam tables with plenty of seating. Web conferencing available for those who cannot attend in person. 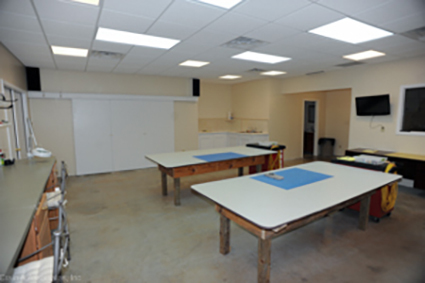 Our laboratory is available for "Third party inspections." 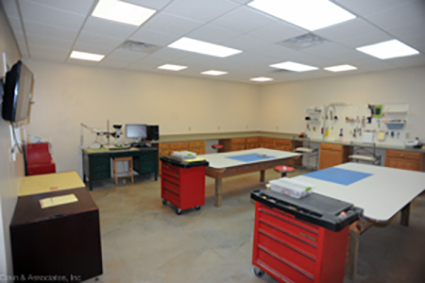 Our inspection laboratory is approximately 500 square feet. Behind the lab is a 700 square foot shop with a 15 foot ceiling height. We can accommodate situations requiring "wet testing", or "dirty artifact" examination. With a 15 foot wide x 12 foot high overhead door, your inspection can be inside or out or a combination, with little effort. On premises secure evidence storage is also available.